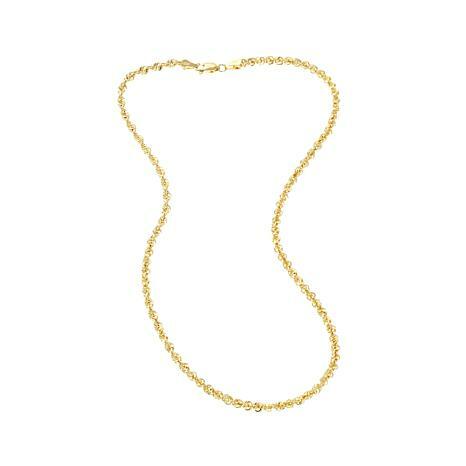 Treat yourself to the rich look of genuine yellow gold with this beautiful, twisted rope chain necklace. 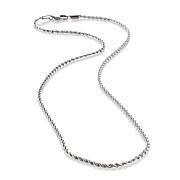 Unique hollow links create more reflective surface area, so you get big, bold shine from a lightweight chain. It looks just as amazing worn solo as it does paired with a favorite pendant. I love the weight of this and the look and style it is definitely an eye catcher!!!! Gorgeous chain to wear alone! I was thinking I didn't REALLY need a 30" chain. But the second I saw it in person - so beautifully sparkly and a nice size to wear alone - I could not part with it. I just LOVE all of Michael Anthony chains. They are so lovely by themselves or with a pendant. Also his silver is rhodium coated - fabulous - no need to polish - nobody else does that - why I would buy silver from him as well. Gold is spectacular. Received heart pendant as well which goes perfectly with this chain. Beautiful. The 22 inch rope chain is beautiful. Yes, light-weight, but good weight for my needs. Love the way it looks: so elegant. Thank you Seller. Very good quality item. Has the look of very expensive jewelry. 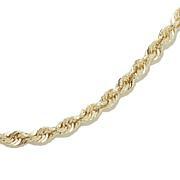 Michael Anthony Jewelry® 10K 1.1mm Brilliant Chain 18"